Currently at view in the window of Walker Terrace is an installation by Tim Clorius titled Whistlejacket II. Presently my painting process is influenced by my interest in 18th and 19th century English painting; particularly George Stubbs has left me deeply impressed. The craftsmanship and painterly facility that went into his work is amazing. The emphasis of a painting as a one of a kind, beautiful, even “magical” hand crafted object that holds within it a story, like a safe does valuables, fascinates me. 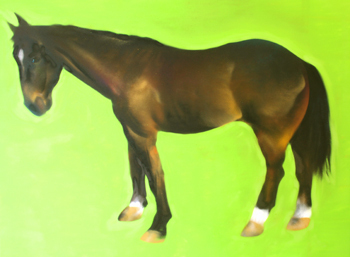 This painting of a horse is part of a larger series on horses that can generally be seen as self portraits, each horse portraying a different personality trait. In terms of formal appearance I see them as contemporary plays on George Stubbs's paintings, especially his most famous work “Whistlejacket”, which broke with convention for having a plain background. Placing this type of traditional subject matter into the present tense by using one of the most contemporary mediums, spray paint, grants me some personally interesting explorations into the different ways I can integrate and express my love for traditional painting, as well as contemporary abstraction and aerosol art within the same work. It also allows me, similar to Stubbs's "Whistlejacket", to break with current conventions about our expectations regarding graffiti art. represent Maine in the 2009 Nationals in Wisconsin. entitled S.U.B.O.N.E: An Urban Mural Project.